I met William Tall during the mayfly season, when we were both invited by Paul Jennings to fish his beat on the Chess. 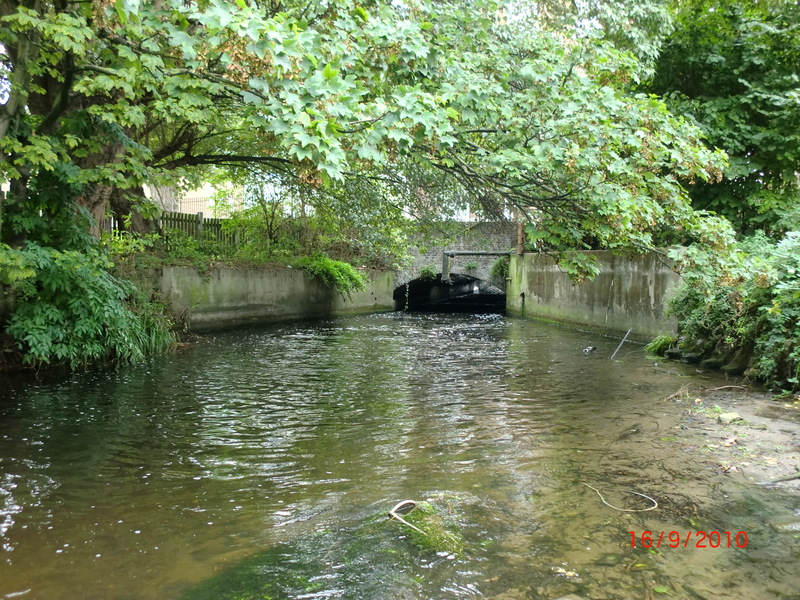 I was fascinated to hear of the work that he and his team have undertaken along with members of the Wandle Trust www.wandletrust.org , on a river which was renowned in the 18th century, as one of the most prolific trout streams in England. Its demise, through the years of the Industrial Revolution is well chronicled, with up to 100 mills in its meagre 9 miles from rising in Carshalton, to entering the Thames at Wandsworth. Its ill treatment by modern man is less well acknowledged, but attempts to improve the water quality and its aquatic wildlife this Millennium, by these two organisations, have been recognised, even if there have been setbacks, plus major chemical pollution in 2007, which killed hundreds (thousands) of fish. 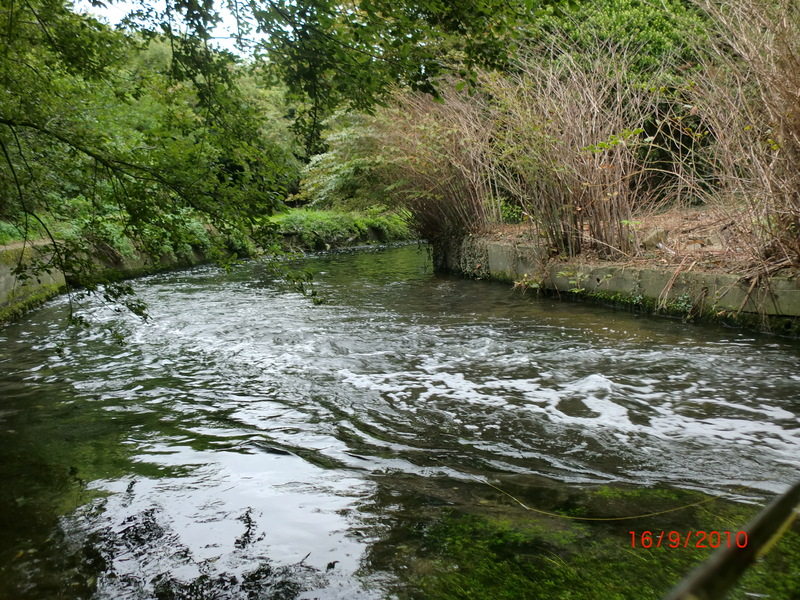 Recently, trout have been introduced to the river in an imaginative scheme for school age children – “Trout in the Classroom”, and trout fry have been found upstream near the old Shipley Mill earlier this year, motivating all involved with thoughts of recovery. Explaining my ‘mission’ and admitting that in spite of walking his river in winter months searching out likely water, I was finding his river a mystery, William kindly offered to guide me to where he thought I might find success. He, like me, is semi-retired, and was able to dedicate a whole day to wandering and casting. 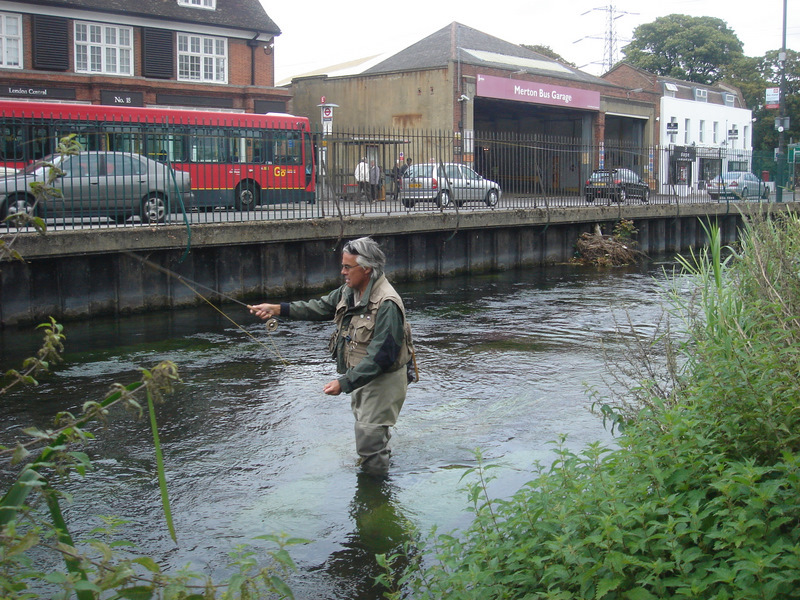 Kitting up in waders in a superstore car park adjacent to a busy London street was always going to amuse some, and it did! But fortified by William’s reassuring smile, and armed with my new Loomis, off we strode across said street and into Wandle Bank, past the John Brown Partnership factory site and round the old Merton Mill (a flour mill, once owned by Scot, James Perry, owner of the Morning Chronicle, a then 18th century Private Eye, but daily!). William said that brown trout and a sea trout, had recently been taken from the mill run. The river is alive. Walking to a Merton Abbey pub, we encountered a young angler who had just caught a whopping big gudgeon of five inches ( the British record is five ounces from the Wiltshire’ Nadder), and whose blog, which William had read, recorded his catch of a 5 lb. carp the previous week. 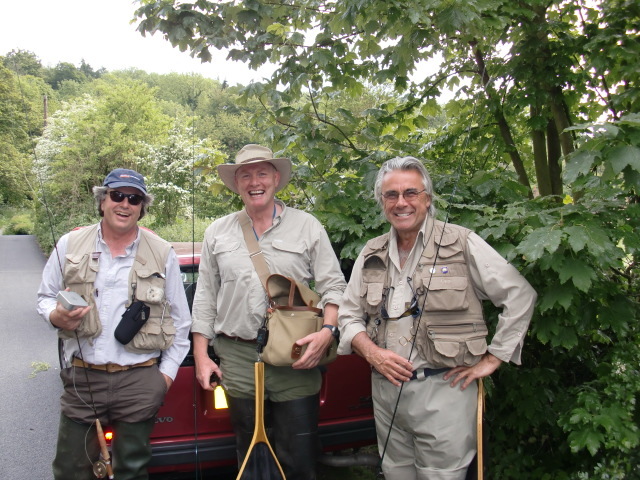 Later we drove to Poulter Park – where we bumped into some coarse anglers, some of whom had, that day, caught trout in this stretch, where some fish in the ‘Trout in the Classroom’ project had been released. We both fished below the inlet from the Water Purification plant to above the weir some one yards downstream, but for no fish. Odd that the coarse anglers were not trying for trout and caught them, and I was trying for trout, and……!!!? Maybe I should try trotting some maggots down that stretch? There followed a short walk and wade toward Goat Mill (where I caught a bleak and a small barbel on the dry earlier this summer), but no fish there today, either! Days later, William sent me a note, with an attachment. A picture of The Piscator’s Senior Vice President, Theo Pike, with his first trout from Poulter Park….what a tease (? )….I will be back, soonest, and I told William that he would be the first to know. Almost two weeks after my day with William, and on a dull grey day, with drizzle in the air, temperatures in the mid teens, Autumn calling, and when I really felt like staying home, but with only three days before the end of the season, I dashed down to Mitcham Common for one last try, and on the Poulter Park stretch. There was a little colour in the water after overnight rains but I took that to be ‘a good thing’. I strode, purposefully, to the weir for a few casts, but I had a plan. It was there first, but for nothing, and then back to the inlet area. It was 1030am on Tuesday 28th. I was fishing a weighted pheasant tail nymph, and using my Moreno bamboo rod. Three casts into the fast water and a take…but it was off! Was it a trout…who knows, but I was encouraged. More casts…and still more casts…a longer line and casts further into the quicker stream. A snag on the back cast…damn! Release it, quickly, for I am motivated !! Another, but longer cast still…and …BANG! !…another take. 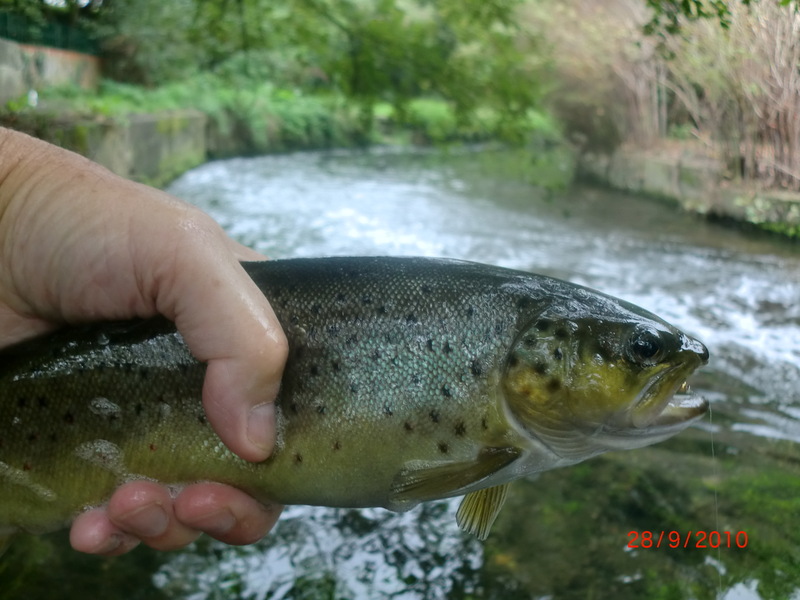 But this fish is well hooked, and after a strong fight….I have a Greater London brownie in my net. Two photographs and he is returned to breed and help to rebuild the brood stock on this recovering water. Some would have fished on. My feelings of accomplishment [‘job done’], or pure joy/relief, but probably gratitude, to this lovely urban stream, and with such a noble history,…said to me – “No, go home” And I did. The season is ended. Perhaps this lovely fish is the most memorable of my year. There are few opportunities to catch a London trout, and with help, I have caught one. And I can’t wait for April next year….I am now off to do some serious plotting. Post script – there is a lovely article posted on Jack Gartside’s website.www.jackgartside.com/art_christmas_queen.htm . (Whilst sadly gone, his site is being maintained by friends) I went to search out what he had found, just in case. The said moat is now gravelled in, and an enquiry to an English Heritage representative in the Jewel Tower, revealed that the moat disgorged itself into the underground car park, used by Parliamentarians, in Abingdon Street, in the early nineties. Jack would have smiled at that…but the trout were gone!